This Website is dedicated to my wonderful mother. 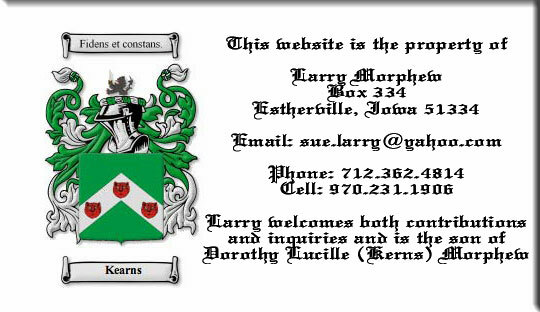 The ancestors of Isaac Kerns came from Ireland to Pennsylvania two or more generations before Isaac. We believe Isaac's father fought in the War of 1812 and that his grandfather fought in the Revolutionary War. The move from Pennsylvania may have been with Daniel Boone . Isaac Albert Kerns was born August 11, 1815 in Bellefontaine, Ohio (Logan County Harrison Township). He died March 20, 1889 at Macksburg, Madison County, Iowa. He married Rebecca Furrow on January 1, 1835. She was born December 1, 1816 in Ohio, Miami County and died September 29, 1887 in Macksburg, Iowa. Her father was John Furrow (or Farrow) who was born in Virginia in 1772 and died May 1848 in Clark County, Ohio. He was married May 17, 1798 at Montgomery, Virginia to Mary Simpkins who was born in 1776 in New York and died sometime before 1840(?) in Clark County, Ohio. Her ancestors lived in New Jersey. It is believed that they came from England or Wales about 1650. John's father also was named John and he died in 1834 in Montgomery County, Virginia. Records indicate that a Jacob Farrow came to America from Holland when he was 7 years old (circa: 1750). This may have been John's father(?). Thomas Longshore Kerns was born November 21,1844 in Bellefontaine, Ohio. He died November 5, 1914 or September 14, 1914 at Bow Island, Alberta, Canada or Medicine Hat, Alberta, Canada. He was selling potatoes that he had raised. While carrying a sack of potatoes into a basement he missed a turn on the steps and the resultant fall killed him. He is buried at Oak Creek Cemetery, Lot 25, Block N, Bottineau, North Dakota. Thomas married Rebecca Elvira Davis on December 17, 1868. Rebecca was born September 22, 1842 at Shelby County, Ohio. She died June 5, 1928 in Jackson County, Minnesota. She is buried at Bottineau, North Dakota, next to her second husband. Her parents were Uriah Davis , born January 16, 1800 (died around 1870) and Vianna Davis who was born February 4, 1804 and died May 30, 1886. She married Joseph C. Simpkins September 1858 and lived around Welton, Clinton County, Iowa. They moved to Nebraska where he died on June 17, 1866. 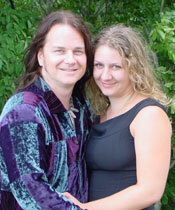 She then married Thomas Kerns . Laura died in 1890. Lillian Richard of Butte, Montana (Roy). Effie Babcock of Riverside, California. Belva Laughlin of Mason City, Iowa (John) 1. Evaline McLane of Lethbridge, Alberta Canada (Frank) 2. Ida Denhart of Denton, Montana 3. Arthur of Windom, MN. Jess of Devils Lake, ND. Will of Norman Oklahoma. Thelma Violet Kerns was born October 10,1889 at Carroll County, Iowa. In 1914 she came to Minnesota with her parents and made their home in Christiana Township in Jackson County. She married Lloyd Borer on December31, 1919 at the Methodist Church in Windom, MN. They farmed and lived on the farm their parents had lived on. In 1970 they retired and moved to Windom, MN. She died October 30, 1973 at Windom, MN. Lloyd was born November 6,1898 at Cabery, Illinois. 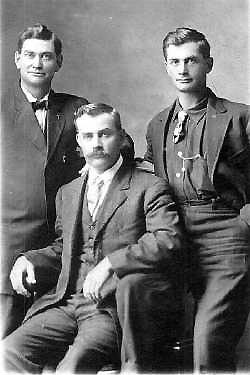 He came to Minnesota in 1910 with his parents. He died November 5, 1977. They are buried at Lakeview Cemetery, Windom, MN. Isabel Marjorie Kerns was born December 16, 1901 near Dedham, Iowa. Her family moved to Milford, Iowa when she was four years old. On February 5, 1924 she was married to Alvie Borer at the Methodist Parsonage in Windom, MN. The couple farmed in Jackson County, retired, and moved to Windom in 1971. Alvie was born June 2, 1904 in Webster County, Iowa. As an infant he came to Minnesota with his family. 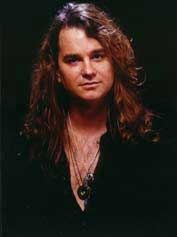 He died January 4, 1990 at Windom. They are buried at Lakeview Cemetery at Windom, MN. 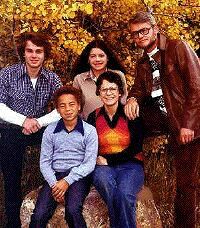 Merle Alvie Borer was born March 28, 1925 in Christiania Township, Jackson County, MN. He married Kathleen Porath on August 29, 1948. He died February 18, 1985 of a heart attack and is buried at Lakeview Cemetery, Windom, MN. Children: Patricia (Fredrick) Bretzman of Windom James of Westby, WI. Rodney of Storm Lake IA. Steven of Bingham Lake, MN. 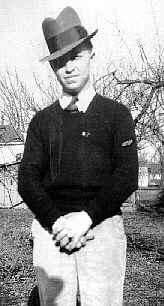 Richard Fredrick Borer was born August, 1928 and died April 19, 1929 of complications of the croup. Buried at Lakeview Cemetery, Windom. Kathleen Adelle Kerns was born October 24, 1943 in Minneapolis, MN. She married John Patrick Gilmer on June 26, 1965. He was born April 16, 1941. Two sons: Todd and Brett . Harold Claire Kerns was born August 26, 1915. He was a member of the State Guard before he was called to service with the Air Cadets. He enlisted as an Air Cadet in February, 1942, and was called to active duty in September, 1942. He received his commission in June, 1943. He was with the 446th Bomb Group, 707 Bomb Squadron. He was a bombardier on a B-24 Liberator Bomber which was shot down over Brest, France on November 18, 1943. His plane had just left Rio De Janeiro a week earlier. The rest of the crew parachuted to safety. Lt. Harold C. Kerns body was returned to the United States from Europe aboard the army transport Carroll Victory. He is buried next to his parents at Lakeview Cemetery, Windom, MN. Jesse Darwin Kerns was born July 13, 1879 and died July 8, 1953. He married Estella Belle Troupe in January, 1903. She was born February 29, 1884 and died in 1980. They were buried in Aberdeen, SD. 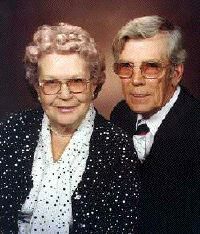 Roy Gordon Kerns - Born Bottineau, North Dakota June 29, 1907. d. 11/11/85 Married Alice Virginia Tadlock . She was born March 6, 1914 in Aberdeen South Dakota. 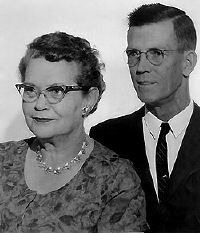 Alice died 2/52/98 ( Alice and Roy are buried in Aberdeen SD) . Clark Dennis who married Maryalys Klemeshrud (first marriage) at the Rock Creek Lutheran Church in Rock Creek, IA (Two children - Michelle - Nathan ). At the time of this entry, Clark and his wife from his second marriage, Jeanne, are retired and live in So. St. Paul, MN. Clark's professional website may be accessed here. Larry Dale (born in Nora Springs, IA on 7-18-42) of Nora Springs, IA, who married Susan Marie Faleo (born in Mason City, IA on 6-6-44) of Mason City, IA at the Methodist Church in Nora Springs, IA on Dec. 9, 1961 (Three children - Melinda Sue who married Robert Noe (first marriage) in Phoenix, AZ and now lives in Ft. Collins, CO with her two daughters Alexandra Danielle [born 7-26-86] and Rachael Gianna [born 7-13-88] - and her husband from her second marriage, Jeff Johnson. 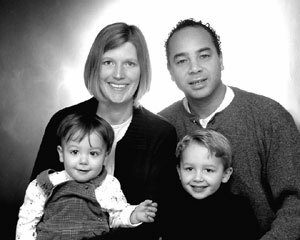 Alan Larry who lives in Van Nuys, CA - and Christopher Clark who married Tanya Kooi in Sioux Center, IA and now lives in Athens, GA with their sons Anthony and Sammy . 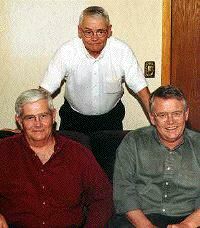 Larry initially was a technical writer for White Farm Equipment, Corporation in Charles City, IA, writing operator's manuals and shop manuals for Oliver Wheel and Crawler tractors. He served as a United Methodist minister in Nemaha, IA, and a United Presbyterian minister in Armstrong, IA during the 1960's and 1970's. 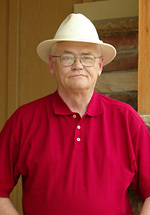 He spent most of his working life teaching science and computers at the Estherville, IA Community Schools in Estherville, IA where he also operated (operates) a part-time photography and web design studio. 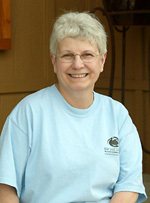 Susan also worked most of her adult life as an elementary teacher in the Estherville Public Schools. Currently she teaches at the Laker Alternative High School at Iowa Lakes Community College in Estherville, IA. 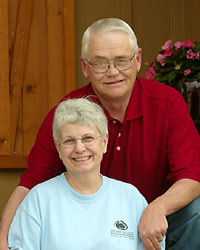 At the time of this entry, Larry and Sue are semi-retired and living on a hobby farm in Estherville, IA. Their website may be accessed here. In the last century, Willis and A. Burdelle Kerns did a lot of research on the Kerns line. If someone has a hard copy of their research and will either scan it for me or send it to me to scan, I'll be most appreciative. Much of the preceding material was sent to me by either Betty Culbertson or Judy (Kerns) Sabatka and was reprinted here pretty much as received. I shall always be thankful to Betty and Judy for encouraging me to upload this information for use by future generations! Betty Culbertson has been researching the Kerns ancestory for quite some time now and it is largely through her efforts that we have as much material as we presently have. Putting together a massive amount of material such as this is not an easy task. View her revisions and latest research BY CLICKING HERE. Nick Nahach of Council Bluffs, IA has sent some interesting updates and will be sending photos and Kerns facts at a future date. Access his emails BY CLICKING HERE. in So. St. Paul, MN. 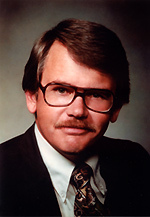 Click Here to access his obituaries and his website. Mr. and Mrs. Larry Dale Morphew Family. Susan Marie (Faleo) Morphew born 1944. Most of the pictures on this website were sent to me by Judy Kerns Sabatka. Judy is my "twin cousin" inasmuch as we were born on the same day/year, etc. She is the daughter of Roy and Alice Kerns and a favorite relative of mine! I had lost track of Judy many years ago and the internet has finally brought us back in touch. Thanks for the information and pictures, Judy! Many of the pictures on this site were from the album of Dorothy Lucille Kerns Morphew (my mother) and Betty Culbertson of Wells, MN. Information and photos from this website may be copied freely by interested Kerns researchers. 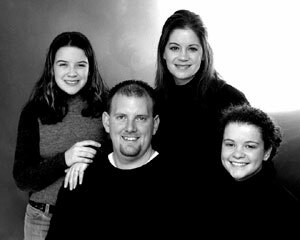 Morphew Photography and Website Design is a professional photography studio registered in the State of Iowa and held in ownership jointly by Susan Morphew and Larry Morphew, Master Photographer. They have been producing high quality legal, commercial, portrait and wedding photographs since 1962 and commercial and personal websites since 1995.